The Royal Palace, residence of the Spanish monarchs until the end of the reign of Alfonso XIII (1931), traces its origins back to a primitive watchtower converted into an Arab fortress (alcázar). It was refurbished by several Christian kings and eventually transformed into a palace, gradually enlarged by the monarchs of the House of Habsburg until it became an official royal residence. 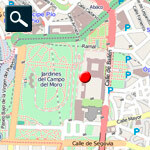 In 1561, Madrid was designated the capital of the Kingdom and the Royal Palace became the main royal residence. In the early hours of 25 December 1734, the Royal Palace was gutted by fire. 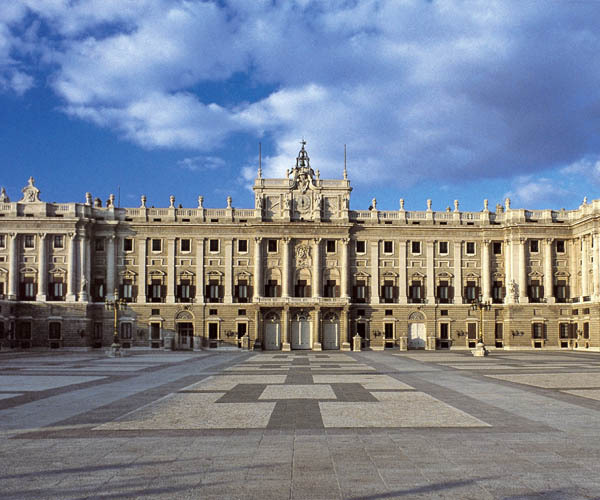 Philip V decided to build a new palace onthe same site that would be much more majestic than its predecessor. In 1735, he commissioned one of the most brilliant architects of the time to work on the project, the Italian Filippo Juvara, who designed an immense building modelled on the Palace of Versailles in Paris. After Juvara’s death in 1736, the plans were modified by one of his disciples and outstanding followers, Giovanni Battista Sacchietti. His plans, while respecting some of Juvara’s concepts, were more modest. Broadly speaking, the square palace has a large central courtyard with sections projecting at the corners (clearly an allusion to traditional Spanish fortresses); Sacchietti also raised the height of the building considerably above what his master had originally designed. The courtyard has a three-storey cloistered design, with arcades on the ground floor, a glazed-window first floor and an upper level set back to accommodate a terrace with lintelled windows. On the exterior facade Sacchietti placed an enormous entablature finished with a balustrade. 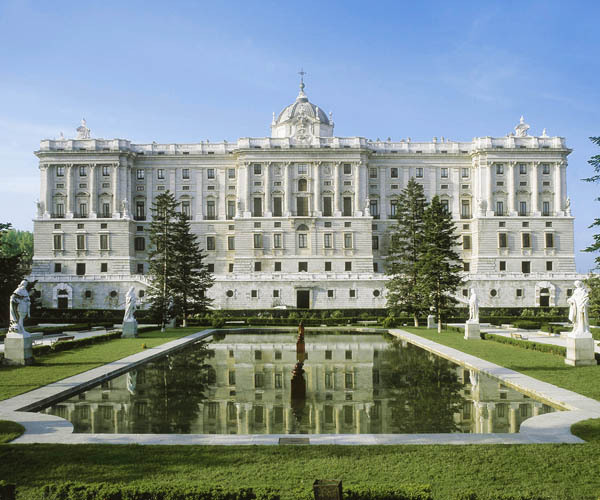 From the outside, the entire palace has a monumental and compact appearance which is perfectly classified as international Baroque in the French style, that is, Classical. It was another Italian, Francesco Sabatini, who, during the reign of his protector Charles III (1759-1788), designed the main staircase. 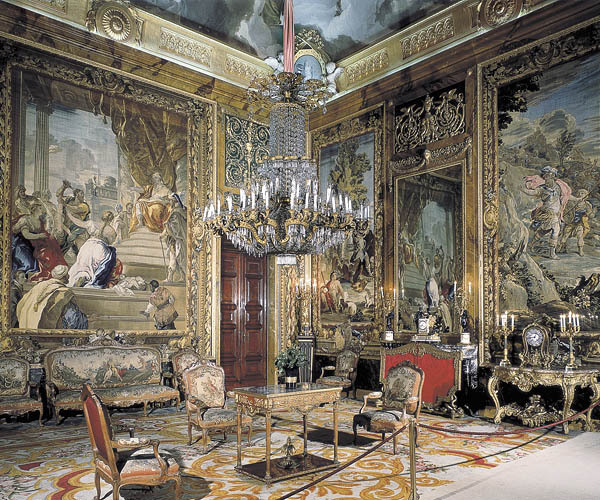 Interior decoration was completed by such great non-Spanish decorators and painters as Corrado Giaquinto, the Tiépolo family and Antón Raphael Mengs and Spaniards such as Maella, Bayeu and González Velázquez. 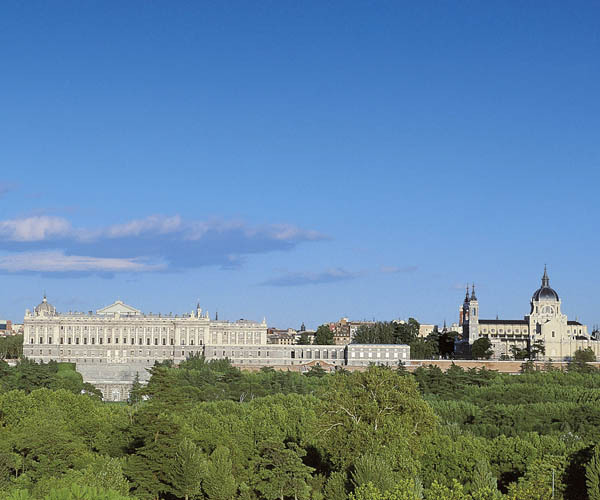 The Royal Palace has paintings by Goya (two portraits each of Charles IV and Queen Maria Luisa of Parma), Velázquez, Caravaggio, Rubens and John of Flanders. Some of the rooms in the Royal Palace are particularly worthy of mention, due to their decoration or exuberance and elegance: the Throne Room, the Gasparini Rooms (with their 18th century Rococo-style chinoiserie), the Porcelain Room (Rococo decoration made by the Buen Retiro Royal Factory), the State Dining Room, the Music Room (with two violins, two violoncellos and a viola by Stradivarius), the Hall of Columns, the Hall of Mirrors, the Royal Library and the Royal Chapel, designed by Ventura Rodríguez in the Baroque and neo-Classical styles.